This is the MAPECU FAQ section. Please also visit our dedicated support forum which contains years of MAPECU information and experiences from us and our customers. Q. What is the difference between the MAPECU, MAPECU2 and the new MAPECU3? A. The MAPECU3 does everything the MAPECU and MAPECU2 did with the addition of extra features e.g. Timing Control, Auxiliary Injector support, O2 Adjust and Electronic Boost Control all in one unit. RPM is also expanded to a maximum of 10,000 RPM and the pressure scale is expanded by rows to +42 PSI. Q. Tell me about the MAPECU3 WiFi module. A. The MAPECU3 WiFi module allows the MAPECU3 to become a WiFi access point. This has been designed primarily to work in conjunction with our iPhone Dashboard App so you can customize a dashboard and monitor your engines vital parameters from your iPhone™, iPod™ Touch or iPad™. We plan on releasing a full tuning version of MAPCAL for the iPad™ in the future. Q. Why can’t I tune the MAPECU3 from an iPhone™? A. The screen is too small to allow for accurate tuning functions, especially utilizing a touch interface. An iPad™ is a much better size screen. Q. Can I use the WiFi interface to eliminate my USB cable for tuning from my Windows PC? A. We are looking at Windows COM port redirectors to make this work. Check the website for updates. Q. What does Timing Control mean? A. The MAPECU3 has eight (8) timing channels that are used to intercept and alter the signals normally going from the OEM ECU to the ignitor(s). You can advance or retard timing by 30 degrees using a 20 x 19 (380 zone) table. Q. So does that mean MAPECU3 replaces my OEM ECU? A. No, MAPECU3 is a piggy-back ECU that allows you to modify many parameters but retain the drivability of the OEM ECU. For example, your OEM ECU still fires the fuel injectors so if you install larger injectors, they need to be the same type. Q. The MAPECU3 seems to have a long list of features. Do I need all of these? A. You only have to use the features you need, but we have tried to incorporate most of the features people add using separate piggy-back units. Using the MAPECU3 you can reduce the number of piggy-back units you have to wire in and tune. Q. Which vehicles will the MAPECU3 work in? A. Most late model vehicles with microprocessor based ECU’s, both domestic and imports. You can usually tell if the current Air Flow Meter and sensors run off 5 Volts. Some older non-microprocessor based systems run off 12 Volts and are not compatible. Vehicles in the mid-eighties started running 5V systems. OEM ECU’s without external igniters cannot be intercepted by the MAPECU3. Q. What type of Air Flow Meter will it replace? A. Just about any 5 Volt Flap, Hot-Wire or Karman Vortex Frequency based units. This covers about 80% of the various vehicles in the market. Q. Is there a different model for Voltage or Frequency based Air Flow Meters (AFM)? A. No. There is only one unit but there are different wires in the harness for different installations. Configuration of Voltage versus Frequency is via the PC based application. Q. What about a vehicle that is MAP based already, can I use the MAPECU3 with one of those? A. Yes, you can. If your vehicle already runs MAP, you can use the MAPECU3 and gain full control over your fuel delivery. However, the installation may not be as straight forward if the MAP sensor is mounted inside your OEM ECU. Talk to us about the details. You will also be able to gain performance with timing control. Q. My OEM AFM contains an Inlet Air Temp (IAT) sensor, what happens when I remove this? A. The MAPECU3 kit contains a new IAT sensor that you need to install in your airbox or intake. You replace the OEM IAT with a resistor that clamps the OEM ECU at 25 degrees Centigrade (77 degrees Fahrenheit), e.g. 2200 ohms is the normal value. The MAPECU3 will then adjust fuel mixtures for inlet air temperature variations. Q. Why should I install a MAPECU3 instead of a full after market ECU? A. Good question. The MAPECU3 is designed for 80% of the people out there who bolt on performance modifications and don’t need to swap the OEM ECU. The OEM ECU in most vehicles is the best ECU for a road vehicle. You can’t beat the driveability and functionality of a OEM ECU unless you spend a lot of money on a top of the line after market ECU and the all-important tuning. The biggest problem most people come up against is not being able to change fuel delivery and timing if they install bigger injectors and other modifications. Usually you have to get a bigger Air Flow Meter that is compatible (not always possible) or somehow modify the existing AFM, which is not usually successful. The MAPECU3 allows complete control of the AFM signal to the OEM ECU so you can tune fuel delivery and timing at any load point. You can also remove the OEM AFM completely eliminating the restriction. The MAPECU3 also adds additional function that are not available in the OEM ECU, like boost control, launch control, etc., which is ideal for forced induction conversions. Q. Can I install the MAPECU3 myself as there are only a few simple connections? A. Yes, but you should have a professional performance tuning specialist tune the unit. Q. How do you get a performance upgrade with the MAPECU3? A. At least three ways: Firstly you remove the AFM, which can be a restriction, especially if you have increased boost, etc. Secondly you are able to tune the Air/Fuel ratios for your engine. The tables in most OEM ECU’s are compromises for the variations in thousands of production vehicles. This means it is not tuned for your engine, especially if you have made changes around the engine for performance. Most OEM tables are very rich to provide a safety margin for the manufacturer against warranty claims. They are also optimised for fuel economy not performance. The MAPECU3 allows you to tune the Air/Fuel ratio for optimum performance or fuel economy of your engine. Thirdly you are also able to optimise the timing of your engine for the fuel you use, and other modifications. Additional performance can be gained if you use the EBC function and raise boost levels. Most customers report improved mid-range ‘punch’ as well as improved power figures. Q. What kind of performance gain can I expect with a MAPECU3? A. That depends on your engine, it’s condition and what modifications, if any, you have made. A Toyota 3S-GTE gained 30kW’s at the wheels in a back-to-back dyno run comparing the OEM AFM with a tuned MAPECU3 configuration, with no change in boost. One of the key aspects is that the MAPECU3 provides you with a great platform for other modifications in the future. Q. Will the MAPECU3 work on non-turbo vehicles? A. Yes, it will. There is no reason why you cannot install a MAPECU3 in a naturally aspirated vehicle so you can remove the AFM and gain complete control over fuel delivery and timing. In fact, you can configure the unit with expanded vacuum sites in the table especially for NA engines to improve tuneability. Q. Why are there multiple pressure scales available in MAPCAL3, even for NA engines? A. We have found that different engines in different configurations have quite different vacuum characteristics. For example, NA engines with individual throttle bodies, instead of a single plenum, usually have less vacuum at idle so we have included a pressure scale configuration with lower vacuum but more resolution to aid tuning. Q. What is required to tune a MAPECU3? A. Because the MAPECU3 is like getting access to the fuel table in your OEM ECU there are 494 entries respectively in the tables to be filled in, but we don’t have access to the OEM ECU information to help us. There are some features built-in to the unit to help with tuning. Firstly there is a ‘learn mode’ which means the MAPECU3 will observe the output from your OEM AFM while you drive around and store the values it ‘sees’ in it’s internal table. This gives the tuner a rough idea of the values you need to start with, e.g. is the frequency 30Hz or 100Hz at idle? Once you have some base data an experienced tuner can fill in the rest of the table, based on experience, so the vehicle will run on the MAPECU3 ready for tuning. Then in a combination of normal road tuning and dyno based tuning the installer can fine tune the MAPECU3 for optimum performance and drivability. This is very straightforward due to the Real-Time tuning capability of the MAPECU3. Most tuning can be accomplished with the tuner and his/her laptop in the passenger seat while someone drives the vehicle normally. Timing adjustments are easier because the table provides Advance and Retard control over the OEM settings. A value of zero (0) means the MAPECU3 is not making any timing adjustment. Q. What RPM and pressures can the MAPECU3 deal with? A. The MAPECU3 table allows for 0-10,000 RPM and up to +42 PSI manifold pressure above absolute atmosphere. The unit can be configured with different pressure configurations but the standard configuration is a pressure scale of –20 inHg to +42 PSI in 2.5 PSI steps. Q. I understand the Auxiliary Injector feature is another way of adding more fuel without installing larger injectors, but what is the O2 Adjust feature? A. Most modern vehicles use an Oxygen (O2) Sensor to feed back the Air/Fuel ratio the engine combustion cycle is running at. The Air/Fuel Ratio (AFR) is represented by a voltage from the O2 sensor. The OEM ECU can modify the amount of fuel injected based on the voltage from this O2 sensor to achieve a pre-programmed target AFR. This is called closed-loop mode. Closed-loop mode is usually used when the vehicle has been driven at light throttle settings, or ‘cruise’. In closed-loop mode, the OEM ECU also varies the AFR very slightly so the O2 sensor voltage oscillates in time with the AFR variations. This is a form of diagnostic mode used by the OEM ECU to ensure the O2 sensor is operating correctly. This is another reason why you cannot substitute a constant voltage for the O2 sensor to ‘fool’ the OEM ECU. When the engine is under heavy load, e.g. heavy acceleration, the O2 sensor is disregarded as older O2 sensors did not have the AFR range to provide an accurate AFR when the engine is run richer for power. This is called open-loop mode. The latest vehicles have higher quality O2 sensors that have extended AFR ranges and therefore the amount of time closed-loop mode is used. When ANY piggy-back ECU is installed and you adjust the AFR’s, the OEM ECU will always try and recalibrate itself to the pre-programmed AFR’s in closed loop mode. This can undo the tuning work you have put into your installation. The MAPECU3 O2 Adjust feature allows you to ‘fool’ the OEM ECU into thinking it is still running the pre-programmed AFR’s even though you have modified them. We provide a 26 x 19 (494 zone) table, which is the same resolution as the fuel table, so you can adjust the O2 sensor voltage by up to +/- 1.00 Volt in 0.01 Volt increments. As we modify the voltage from the O2 sensor, the OEM ECU will still ‘see’ the voltage oscillate as it varies the AFR slightly. Q. Why are there two (2) independent sets of tables? A. The MAPECU3 has two (2) independent sets of fuel, timing, auxiliary injector, O2 adjust and EBC tables called Primary and Secondary that can be selected using a dashboard mounted switch. We provide two (2) tables so you can have different level of performance or economy based on the octane rating of fuel you use, e.g. Primary for 91 Octane and Secondary for 98 Octane; or Primary for LPG and Secondary for Petrol; or Primary for normal performance and Secondary for ‘valet’ mode; or Primary for fuel economy and Secondary for Performance, etc. Q. Where should the MAPECU3 be mounted? In the engine bay? A. No. The MAPECU3 should be mounted as close to the OEM ECU as possible to minimise the cable lengths, as long as the OEM ECU is not mounted in the engine bay. 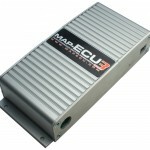 The MAPECU3 is very rugged but is not a sealed unit like most OEM ECU’s. Usually the MAPECU3 is mounted next to the OEM ECU in a kick panel or similar. A vacuum line has to be run from the plenum to the MAPECU3 for manifold pressure sensing. Q. Do I need a PC connected to the MAPECU3 all the time? A. No. The PC is connected only for tuning and is disconnected afterwards. A PC is only required if something is changed on the vehicle and it needs to be retuned. Q. My laptop only has USB ports, how do I connect the MAPECU3 to my laptop? A. The MAPECU3 now has a USB port which is a big improvement over the MAPECU and MAPECU2. The MAPECU3 can be powered from the USB port when not running the engine so you can configure it away from the vehicle. Q. Is there a limit to the number of times I retune my MAPECU3? A. Not really, the memory in the unit can be reprogrammed 100,000 times. Q. What happens if the MAPECU3 loses +12 Volts? Do I lose my tuned table? A. No. The MAPECU3 uses non-volatile flash memory technology, which means it does not need any power to retain its memory. In fact, only switched 12 Volts is connected to the unit. Q. Are there standard configurations for common vehicles? A. Yes and no. Some common tables are provided on our website but they are only useful as a starting point as every engine is different and the performance modifications are different. Contact us for a table similar to your vehicle. Q. I have a MAPECU or MAPECU2, can I purchase a new MAPECU3 and easily upgrade? A. Yes, in fact the 16-Way, 18-Way and 3-Way connectors have the same basic wiring layout apart from the additional features of the MAPECU3. MAPCAL3 will also import so you can upgrade your MAPECU or MAPECU2 table to work with the MAPECU3. Q. I have a MAPECU or MAPECU2, can I upgrade the same unit to a MAPECU3? A. No. The hardware contained in the MAPECU3 is completely different to the MAPECU and MAPECU2. Q. The MAPECU3 has Electronic Boost Control (EBC), how does that work? A. The MAPECU3 Switched Output #2 can be configured to drive a wastegate control solenoid in one of two modes. Mode 1 has the solenoid configured to bleed boost pressure to atmosphere to raise boost. Mode 2 has the solenoid configured to control boost pressure leading to the wastegate so boost is built more quickly and can be raised. Q. I have a stepper motor actuated wastegate, will the MAPECU3 control that? A. No, the MAPECU3 only operates with an air pressure solenoid. Q. What parameters do you need to configure for EBC? A. There are two (2) global parameters: EBC Sensitivity and EBC Gain. EBC Sensitivity is a percentage in the range 0-100% and configures at what percentage of target boost the wastegate will start opening to, to soften the resulting boost curve. EBC Gain in the range 0-20 configures the speed the EBC software reacts to changes. Q. The EBC has pressure and duty cycle parameters every 1000 rpm. How do they work? A. EBC duty cycle configures the solenoid duty cycle required to achieve the target boost. EBC pressure is the target boost required. These parameters can be configured every 1000 rpm based on the required boost versus rpm curve. If the duty cycle configured results in over boost, the MAPECU3 will alter the duty cycle to achieve the target boost. This computed target boost is shown in the EBC Cduty % row and can be used to update the target boost parameters. Q. My vehicle uses a distributor, can I use the MAPECU3 to control timing? A. Yes. As per the MAPECU3 manual, use ignitor channel 1 for the single ignitor distributor based engines. Q. My vehicle has the ignitor built-in to the OEM ECU, how can I use timing control? A. You will need to purchase a single channel ignitor to drive the ignition coil. Connect the OEM ignitor output to channel 1 input of the MAPECU3 and the new ignitor to the MAPECU3 channel 1 output. You will also need to configure the MAPECU3 ignitors as ‘negative going’ as per the MAPECU3 manual. Q. My vehicle has an ignitor per cylinder or Coil On Plug (COP), will this work with the MAPECU3? A. Yes, the MAPECU3 has eight (8) ignitor inputs and outputs for up to eight (8) COP ignitors. Q. The MAPECU3 manual has various engine configurations and firing orders described. If my engines firing order is different to those described, can I use the MAPECU3? A. Yes, the MAPECU3 can handle any firing order. You must connect the ignitor channels in firing order so if the firing order is 1, 3, 4, 2, then channel 1 is connected to cylinder 1, channel 2 to cylinder 3, channel 3 to cylinder 4 and channel 4 to cylinder 2. Q. My engine only has four (4) cylinders, what do I do with the other four (4) ignitor channels of the MAPECU3? A. Only use channels 1-4 and do not use channels 5-8. Q. The MAPECU3 has a Fuel Cut Defender (FCD), how does this work? A. Fuel Cut on most OEM ECU’s is controlled by the voltage from a MAP sensor or some kind of voltage based sensor. The built-in FCD has a voltage input, output and a clamp voltage setting all configured using MAP-CAL2. The voltage clamp setting configures the voltage the input voltage is clamped to. There is also a release pressure setting so you cen reinstate fuel cut in the event of overboost. Q. The MAPECU3 has a Speed Cut Defender (SCD), how does this work? A. SCD is similar is the FCD in that the input is clamped to a configured setting. The difference is that SCD is based on a frequency signal rather than a voltage. SCD is only available when the MAPECU3 is configured in MAF voltage mode. Q. The MAPECU3 has a Speed Cut Adjust (SCA), how does this work? A. SCA uses a setting of 0.00 to 2.00 to adjust the input frequency. A value of 1.00 means the output frequency is equal to the input frequency. A value less that 1.00 adjusts the output frequency lower than input. A value greater than 1.00 increases the output frequency above input. Output frequency = Input frequency x SCA setting. SCA is only available when the MAPECU3 is configured in MAF voltage mode. Q. The MAPECU3 has Launch Control, how does that work? A. Launch Control only operates when ignition timing is wired into the MAPECU3. A clutch switch needs to be connected to a configured input and the launch control RPM set. When the clutch switch is active and the engine RPM increased beyond the launch control RPM, the MAPECU3 will mis-fire the engine by dropping ignition pulses to hold the engine as the configured RPM until the clutch switch is inactive. The MAPECU3 launch control also has the option of a speed input so launch control is not released until minimum speed is achieved to reduce wheel spin. Q. The MAPECU3 has Advanced Nitrous Activation, how does that work? A. The MAPECU3 Nitrous channel 1 can be configured to activate based on boost pressure, RPM, throttle position and speed to reduce wheel spin on nitrous injection. This function alone requires a number of boxes costing more than the MAPECU3. Q. I see the MAPECU3 has an external MAP sensor input, why do I need that if the MAPECU3 has a built-in 42 PSI MAP sensor? A. Some customers have asked for expanded pressure scales up to 5 Bar so instead of installing a 5 Bar internal pressure sensor, that 90% of people will not use, we installed a 42 PSI sensor with the option to add an external sensor for higher boost. It also gives you the option of installing a MAP sensor remotely to the MAPECU and running wires instead of a vacuum line. Another added benefit is that if you do not use the connector for an external MAP sensor, you can allocate it to another function. Q. What external MAP sensors does the MAPECU3 support? A. The MAPECU3 currently supports the GM™ 2 & 3 Bar MAP sensors and the AEM™ 5 Bar MAP sensor. We can add MAP sensors easily in the future as it is driven by a configuration file rather than programming. Q. What is TPS Enrichment and how much should I use? A. TPS Enrichment instructs the MAPECU3 to add additional fuel when there are fast transitions of the throttle pedal, e.g. ‘blipping’ the throttle at idle. It requires a variable Throttle Position Sensor (TPS) in the vehicle connected to the MAPECU3. The amount of enrichment is directly related to the speed of the transition. You should do all tuning in the table without any TPS or MAP Enrichment, i.e. all fields zero. Only when you have the table tuned to 99% should you use TPS Enrichment to solve any hesitation issues. Even then, it is recommended that you use no more than 7% Enrichment. Q. What is MAP Enrichment and how does it compare with TPS Enrichment? A. MAP Enrichment instructs the MAPECU3 to add additional fuel when there are fast positive transitions of manifold vacuum, i.e. transitions from high vacuum to low vacuum or boost. You would see this when the throttle butterfly is opened quickly. The amount of enrichment is directly related to the speed of the transition. MAP Enrichment is only used on vehicles with no variable TPS and when hesitation cannot be solved using the table. As with TPS Enrichment, use minimum values up to 7%. A. Click this link to download our Warranty and Returns Policy.